I have a LOT of bookshelves in the house. Far more than my husband would like (leaving less room for guitars), but far fewer than I really need. Here are some of them, and a small selection of the books that stick out for me. This is one of the dining room bookshelves. On the top shelf are quite a lot of modern French novels, dating back to my degree in French and Italian, which I loved. My husband worries that too much Proust might put people off their food, but I think he's a total genius (Proust, not my husband, although he's amazing, obviously). I suppose I should admit I haven't read any of these since, but I adored them then and I hope I'll get the time to go back to them one day. Not far along is a Dan Brown. I wanted to rewrite almost every sentence of The Da Vinci Code, but I absolutely couldn't put it down. The plotting and concept were brilliant, and there were all those codes to crack, which I always enjoy. Further down still is Fermat's Last Theorem, by Simon Singh. One of my most favourite books, by one of my favourite non-fiction writers. It's about the beauty of maths and the thrill of solving one of the great mysteries of mathematics. Just as exciting as the Da Vinci code, in its way. Simon has also written The Code Book (on a different shelf of mine, below), which is just about codes and codebreaking through history. Heaven. The rest here is largely travel, art history, chicklit and thrillers, with a few classics thrown in. Which pretty much sums up my leisure reading tastes. 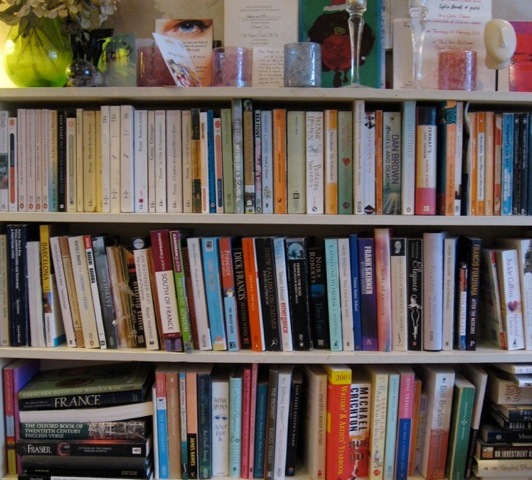 Did you spot a Jackie Collins or two in there? Possibly you did. This is a section of the main bookcase in my writing shed, which is by my left elbow when I'm writing in the warmer months. (In this cold winter, I tended to do a lot of writing in bed.) There's a section of Threads in all its different English and foreign additions, which I love as it makes me look a lot more prolific than I really am. There are also the tools of my trade - the dictionary, the Writers and Artists Yearbook, the encyclopaedia of English literature ... All of which I used to use a lot before the advent of the internet. Now I have to admit they're more decorative, but I still love to have them around. It wouldn't feel like a writing shed without them. Then there are many of my favourite children's books, old and new. A Little Princess, Harry Potter, Cressida Cowell's How To Train Your Dragon series, some Sarah Dessen, and Skellig, by David Almond. They're what I turn to when I need writing inspiration. However, books by my writer friends tend to end up in my bedroom (more bookshelves ...), so there's another selection there. 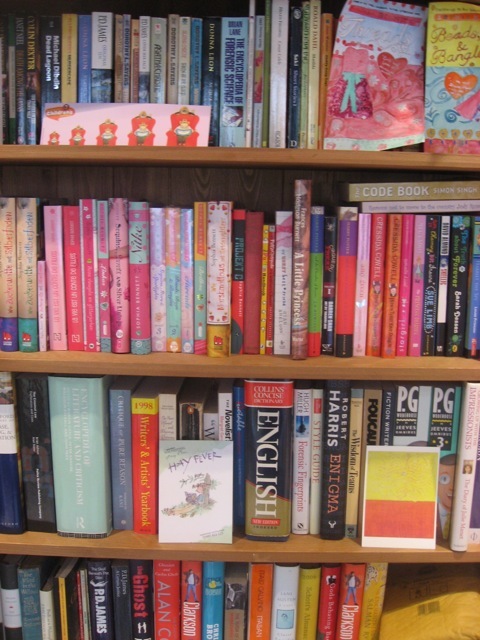 It's far too messy to show you - books upon books upon books - so you'll just have to imagine it. On the top shelf here, meanwhile, I've got lots of detective fiction. I inherited my love of it from my mother and I've read all my life. My favourites are by Dorothy Sayers and if I could marry one fictional character, it would have to be Lord Peter Wimsey. There are also some books on forensics, left over from the time when I was trying to write detective novels myself. I wrote three or four, but they didn't make it as far as publication. Perhaps I'll go back to them one day. The PG Wodehouse omnibuses are essential. He is one of my most favourite comic writers and I know several scenes by heart. Below those are some Alan Coren and Jeremy Clarkson - more skilfully written comedy. The postcards and cover illustrations from fans at the front are an idea I pinched from my publisher, Barry Cunningham, whose house is lined with books and who uses them as a backdrop to his eclectic postcard collection. 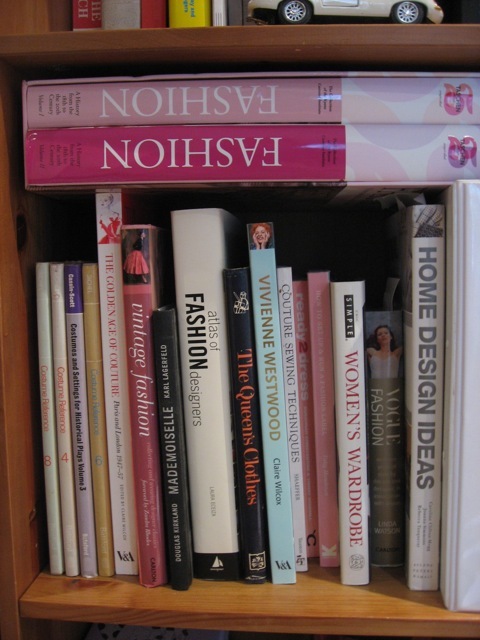 This is my fashion bookshelf, which is just along from the other one. It contains a small selection of my fashion books, including many of the ones I consulted for the Threads series. I've had some of the costume books for over thirty years, while my husband gave me the Kyoto costume museum books (the big pink ones at the top) for my birthday last year. They are stunning. Each dress is a work of art in itself. 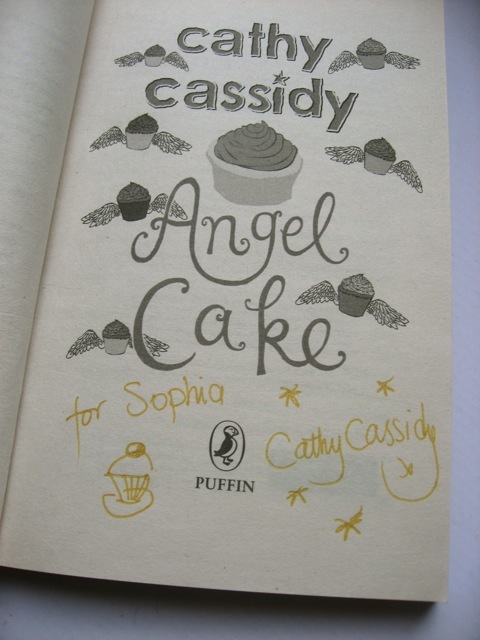 From the bookshelves in my bedroom, this copy of Angel Cake by Cathy Cassidy is very special to me, because it's the first book that I ever had signed for me. Before I met Cathy, I couldn't really understand why fans wanted signed books, but after she drew her little cupcake for me, I got it completely. She even asked me to sign a copy of Threads for her that day. I've been a fan of hers for ages. Go Cathy!